One definite way to disenfranchise the yellow vests - as they crush French autocracy - would be to set them up as the fall-guys for this national disaster. Surely that is not possible! Update 1: A silver lining - if that's possible: a Catholic priest was today hailed a hero as it emerged he entered the Notre-Dame last night during the height of the inferno to rescue precious cathedral relics including the Crown of Thorns. The hallowed artefact, which symbolises the wreath of thorns placed on the head of Jesus Christ at his crucifixion, was stored in the cathedral's treasury and was brought to Paris by French King Louis IX in 1238. 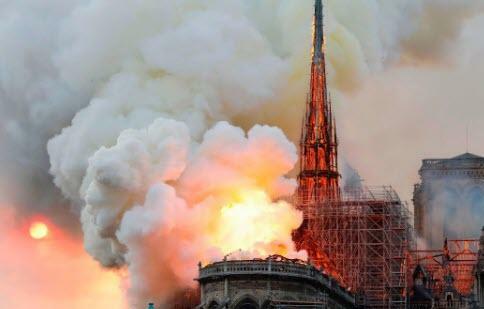 Jean-Marc Fournier, Chaplain of Paris Fire Brigade, was also said to have saved the Blessed Sacrament last night from the 850-year-old Gothic masterpiece.